Halloween has always been a complicated holiday, laced together with many threads of different spiritual traditions and cultural customs. It has always stirred up controversy, morphing into an excuse for mischief and mayhem and a celebration of ghoulishness which has led some to boycott it altogether. Put perhaps this is a hasty decision, which fails to take into account the whole picture of the historical development of the day and what it tells us about the richly complex human search for the meaning of life, death, and eternity. In the ancient Pagan world, there was a variety of autumnal festivals dedicated to one deity or another and celebrating the coming in of the harvest. Half way between the Autumn Equinox and the Winter Solstice, the Celts would celebrate their “new year” at Samhain (“Summer’s End”), which marked the third and final phase of their harvest season with the gathering of nuts and berries and the slaughtering of livestock that could not be fed through the winter. It was a time of plenty and abundance, merry-making and story-telling. One legend commonly associated with this time of year was that of Mongfield, a legendary sorceress-queen who was said to have married the King of Tara in ancient Irish mythology. However, on the other end of the spectrum of festivity, there was the threat of the coming winter and the constant struggle for survival it would bring. With this ominous reality hanging over the people, Samhain became a time of soul-searching and intention seeking as Druids took part in various divination and scrying rituals and attempted to tell the future and predict the outcome of the year. Bonfires were also an important part of the celebration, being identified with protective and cleansing powers, as well as the ability to ward off the cold and darkness of winter. Also, they served as a point of communal gathering and the sacrifice of a portion of crops and livestock to the gods, both in thanksgiving for the harvest and to seek their favor in the months to come. No fire was allowed to be lit during Samhain until the ceremonial bonfire was lit by the Druids at a designated hill which they held sacred. As a deeply mystical people who intently focused on the workings of nature, the Celts ascribed a spiritual element to the shifting of the seasons which their calendar was centered upon. In the waning days of autumn, darkness lengthened, the leaves fell, and foliage withered. The world seemed to be dying, and yet the Celts found comfort in the knowledge that the Wheel of the Year would continue to turn and spring would come back again. With all these thoughts about death and afterlife on their minds, they believed that in October the veil between the mortal and spirit worlds grew thin, just as the air felt crisp and thin. This concept of an otherworldly portal nurtured the belief that the spirits of the dead, gnomes, faeries, and other mythical creatures might visit the living on Samhain. Hence people would leave out food for any spirit visitors who might show up and special bread was baked on Samhain for the occasion, often using the symbolically significant ingredients of rye, caraway, rosemary, and buttermilk. At the feast, a place would be left empty for any ancestors who might wish to visit and break bread with them. Later, the bread would be given to those less fortunate. Visits would also be made to the burial mounds of dead relatives and friends and bring symbolic offerings to leave there such apples (symbols of eternity) and nuts (symbols of wisdom). In addition to visiting spirits, it was also a day of departing spirits. 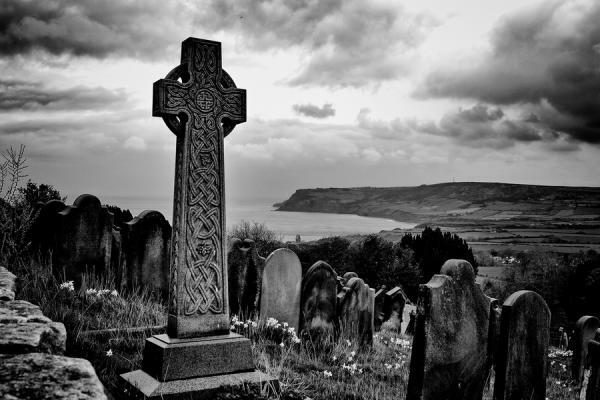 Since the Celts believed that the souls of the dead did not immediately leave earth, it was thought that those who had died within that year were finally rounded up by the Lord of Death on Samhain night, beckoning them with a horn blast to prepare to make their journey to the Otherworld. Tradition held that the “new day” really began at dusk, so the night time celebrations had special significance, and brought to the fore a sacred animal: bats. Because of their ability to fly at night, and because they were considered to be “in between” the bird and mammal families, they were considered to be perfect messengers to deceased loved ones in the world beyond. Their presence around ceremonial fires, drawn by the abundance of tasty flying insects, associated them with the season as well. When Christianity spread across Europe and came to the Celtic peoples through St. Patrick and others, the traditions associated with Samhain showed no signs of abating. Celtic Christianity always had a distinct flare for bringing out the best in old and new and taking the mysticism and deep respect for nature found in Druidic society and applying it to Christ, High King of the Universe. Since there were many things perfectly compatible with Christian teaching within the celebration of Samhain, the Church incorporated them into the celebration of All Hallow’s Eve, or Hallowe’en on October 31, which served as a Vigil celebration of All Saints Day on November 1. Christians too shared a deep regard for deceased souls and the honor of those who had gone ahead into the next world. However, instead of the Pagan belief that souls wondered the earth after death, Christians believed in Purgatory, a “waiting place” where souls were purged of their imperfections before entering Heaven. Prayers offered lovingly for the decease would go towards the purification process and enable them to reach Heaven sooner. Aside from this, meditating on death, in and of itself, was considered to be healthy for spiritual development. After all, it assured than human beings never forget their mortality and come to think of themselves as gods, and who never stop putting their focus on the Divine and the world to come. Now this seriously simplified the spiritual significance of the evening, but the idea was that before a soul cake could be given out, the “mummers” had to say prayers for the deceased family members of the house they were visiting. Meanwhile, special vigils would be held at cemeteries and within monasteries to offer prayers for the deceased. They would continue on through All Saints Day on November 1, celebrating the triumph of the saints and martyrs spending eternity in the presence of God, and All Souls Day on November 2, again to focus on the souls in Purgatory. Again, old traditions from Paganism remained a major part of All Hallows, including the concept of the dead making visits to the living. People would dress up to scare off or befuddle any evil spirits who might make appearances, and also came to the consider the veil-thinning time something of an excuse to turn the world upside down. It was a day was darkness was coming in, and people believed they could show their dark sides as well. Most of the time, this was in the form of pranks and mischief-making, but nothing terribly harmful or serious. However, during the Protestant Reformation in the British Isles, Catholics were targeted by Protestants rabble-rousers for celebrating the triple feasts of All Hallows, All Saints, and All Souls, and often were tormented by mobs and gangs in the streets who accused them of celebrating “Pagan Practices”. The close proximity to Guy Fawkes’ Day, which celebrated the failure of a Catholic plot to blow up King James I and his parliament, did not help matters. Bonfires would be lit, Guy Fawkes and the pope would be burned in effigy, and no Catholic was safe to venture outside for fear of his life. But for Protestants in England it was, and remains, a festive occasion, complete with special potatoes to eat and fireworks to explode. In conclusion there are many links with the modern secular celebration of Halloween and the traditional spiritual traditions of both Pagans and Christians. Unfortunately, I’m afraid much of the meditative reflection on the eternal has been drained in favor of an excessive display of plastic pumpkins, glittery witches, and electric flying bats. But worse is the excessive bend towards gruesomeness and gore. While I can certainly understand the gray areas of life, and acknowledging our own complex human natures (which some have called “the dance between light and dark”), perhaps there is something unhealthy about allowing oneself too heavy a dose of the macabre, especially if it is for its own sake, and not directed towards some higher good such as soul-searching about the meanings of existence and the essence of humanity.